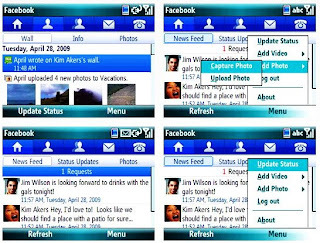 Digi Bay: Facebook in Phone come to life. Facebook in Phone come to life. Facebook now can be use in our PDA Phone that run on window mobile 6. 1) send messages or call people in your friend list whenever you like. 2) manage your profile and post anytime and anywhere. 3) take pictures and video on your u, upload it anytime. Facebook come alive in your mobile, your life come alive in all your friend and family. You can now upload all your photo and video whenever u like. Take a photo then upload to facebook.